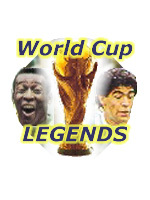 Other legends!Baggio, R.Banks, G.Baresi, F.Beckenbauer, F.Bergomi, G.Boniek, Z.Brehme, A.Breitner, P.Butragueño, E.CarecaCeulemans, J.Charlton, B.Cruyff, J.Cubillas, T.EusebioFillol, U.Fontaine, J.GarrinchaHagi, G. Hurst, G.JairzinhoKempes, M.Klinsmann, J.Kocsis, S.Krankl, H.Krol, R.Lato, G.LeonidasLineker, G.Maier, S.Maradona, D.Matthaus, L.Meazza, G.Milla, R.Monti, L.Moore, B.Muller, G.Neeskens, J.N'Kono, T.Overath, W.Passarella, D.PelePlatini, M.Puskas, F.Rensenbrink, R.Riva, L.Rivelino, R.Rossi, P.Ruggeri, O.Rummenigge, K-H.Scarone, H.Schiaffino, J.Scifo, E.Scirea, G.Seeler, U.Skoglund L.SocratesStabile, G.Stoitchkov, H.Tomaszewski, J.Valderrama, C.Varela, O.Vogts, B.Völler, R.Walter, F.Yashin, L.ZicoZoff, D.Zubizarreta, A.
African soccer had its first real break-through on the world stage in 1982. Cameroon held Peru, eventual winners Italy and semifinalists Poland to draws in the first round group. They only let in one goal, a lucky header by Italian forward Graziani, but it was enough to send them home because Italy had 2-2 in goals compared to Cameroon's 1-1. Thomas N'Kono was the main reason to their impressive defensive record. He showed goalkeeping at its finest and was nominated as one of the best goalkeepers in the tournament. Quite an achievement for the 26-year-old who was virtually unknown to the soccerworld outside Africa at the time. Twice named African Player of the Year in 1979 and 1982, he stayed on in Spain after the 1982 World Cup with Barcelona club Español. With this club he stayed faithful for nearly a decade until he retired. With his native club back in Cameroon, Canon Yaounde, he won five league championships before he travelled to Europe. He won the African Nations Cup in 1984, but missed out on qualifying for the Mexico World Cup two years later. Cameroon qualified convincingly to the World Cup in Italy 1990, but not many fancied them to emulate their great showing eight years earlier. After their sensational 1-0 win over defending champions Argentina in the opening game, Cameroon continued in style until they were knocked out by England in the quarterfinals. N'Kono had another fine tournament and could retire as a proud man. He was the first African goalkeeper to earn a contract in a professional club in Europe, and the first to keep a clean sheet in a World Cup match. Apart from the 4-0 defeat to Russia in 1990, a match which meant nothing to Cameroon as they already had made it to the second round, N'Kono only let in four goals from open play in seven games in his World Cup career. A remarkable record knowing how fragile the African sides have been defensively over the years. 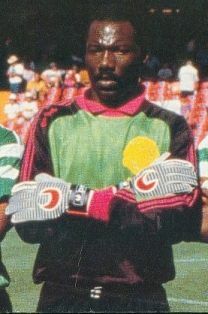 Surprisingly enough N'Kono was tempted out of retirement to join the Cameroon team in the 1994 World Cup as third choice goalkeeper, but didn't play a minute in that tournament. He ended his career there and is currently working as goalkeeper coach for the Cameroon national team.